JPMorgan Chase & Co.’s Jamie Dimon picked a fight with President Donald Trump -- and immediately regretted it. After the inauguration, he said Trump had reawakened “animal spirits” in the U.S. Dimon has also praised the president’s softer regulation and a tax policy that’s generous to rich companies and people. Dimon was a member of the president’s strategy and policy forum -- a council of U.S. business leaders -- but it disbanded last year in the backlash to Trump’s response to a white-supremacist rally in Charlottesville. And this year, Dimon said the administration’s policy of separating children from parents at the U.S. border with Mexico was cruel. 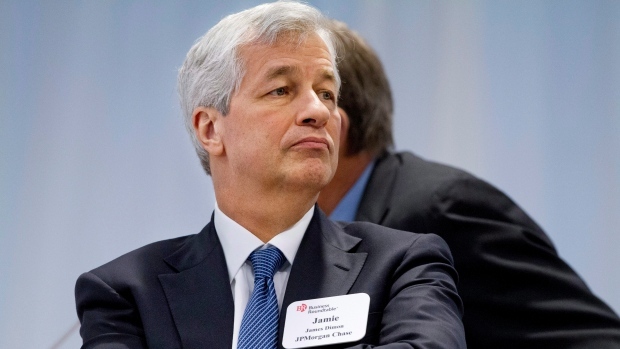 Dimon has taken shots at others in Washington without swiftly reversing himself. In 2015, he said he doubts U.S. Senator Elizabeth Warren, a critic of large banks, “fully understands” the global financial system. Trump has had his own ups and downs with the financial world, even though he’s surrounded himself with some of its leaders. He campaigned as someone who would stand up to the industry, and his closing ad flashed a Wall Street sign, Federal Reserve logos, and the New York Stock Exchange over eerie music and a speech. When previously disavowing any intent of running for the U.S. presidency, Dimon has said he’s not sure being a corporate leader translates well into the political arena. His bravado landed him in trouble on Wednesday.